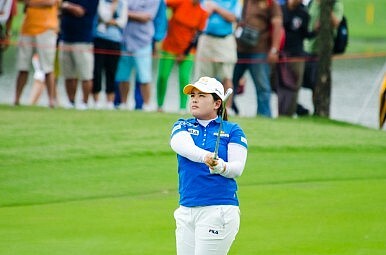 Just when it looked as if the Asian players’ dominance of women’s golf was over, they’re coming back with a vengeance. When Mo Martin won the Women’s British Open in July, it represented a nadir of sorts for Asian golfers, who had dominated the LPGA Tour for the past several years. It was the fourth consecutive major won by a non-Asian – the longest such “drought” since 2008. Worst yet, of the first 17 LPGA tournaments of the season, only one was won by an Asian. South Korea’s Inbee Park was in slump that stretched for nearly a year while former World No. 1 Yani Tseng of Taiwan struggled to regain her form after becoming the youngest golfer (male or female) to win five majors. But if the British Open represented the abyss, Asia’s golfers have rapidly climbed out of it. Since Martin’s unlikely victory at Royal Birkdale, Asians have won 10 of the last 12 LPGA tournaments, with Koreans taking nine and China’s Shanshan Feng claiming the other. Park won the LPGA Championship to end Asia’s (and her own) majors drought, and her countrywoman Hyo Joo Kim took the Evian Championship, the year’s fifth major. But the breakthrough star is Korean rookie Mirim Lee, who earned her maiden victory in Michigan in August and then added a second title in China in October. Heading into next week’s year-end CME Group Tour Championship, Asian golfers occupy half of the top 10 spots on the money list and seven of the top 13. After a slow start to her season, Park still has a chance to catch American Stacy Lewis to finish atop of the money list for a third straight season – and a sixth consecutive by an Asian golfer. Park has already reclaimed the No. 1 World Ranking from Lewis last week as she bested the American by two strokes at the LPGA Taiwan Championship. A couple of weeks after getting married to her swing coach Gi Hyeob-nam, Park held on in a final round played in light rain. The showdown between Park and Lewis in Taiwan just might be the beginning of a budding rivalry. It’s something the LPGA has craved for years, dating back to at least the early 2000s when Sweden’s Annika Sorenstam and Australia Karrie Webb dueled. Park and Lewis both won three times on tour this year, and are ranked 1-2 in the World Ranking, money list and player of the year points race. They have also combined to finish in the top 10 a staggering 61 times over the last two years, but strangely, they’ve finished together in the top five just six times in that same span. The close finish in Taiwan, where the duo was paired in the final group and ended up 1-2 was the first time that’s ever happened. And Lewis, for her part, would like to see more of it. “We have pushed each other, just to be more consistent,” Lewis said. “That’s something I saw in Inbee last year, how well she played under pressure. We put pressure on each other to get better in general. A budding rivalry between its top players is nice, but it’d be even better for the LPGA to have a competition pitting its best players from both sides of the Pacific against each other, especially with the recent rise of young American talent such as Lewis, Michelle Wie, and Lexi Thompson. The Solheim Cup, featuring American and European teams, has struggled to hold the golf world’s interest in recent years, given that more than half of the LPGA’s best players are missing from the event. The Lexus Cup, pitting Asia against the rest of the world, never really caught on and was scrapped in 2008 after just four events. The LPGA has done much to grow its interest and footprint across the Pacific, with this year’s just-concluded six-event Asia swing as a good start. What it needs now is a new team competition that would really inspire passion from its best players and most rabid fans. There’s got to be a sponsor out there that wants to put its name on an Asia vs. America showdown between the best women golfers on the planet.